Jim Determine is as closely connected to Longs Peak as is Shep Hosted. Jim was Longs Peak Supervisory Climbing Ranger/Law Enforcement from 1987-2009, and a Longs Peak Climbing Ranger/Law Enforcement in 1986, and worked as a ranger at RMNP from 1984-2009. The following are his words. Those of us with the achievements of today are only here because we have stood on the shoulders of those who climbed before us. We are not better climbers than they were; we merely have the benefit of taking the route knowledge, equipment advances, and the positive attitudes given by the successes of previous generations to the next level. Jim Detterline, 2010. Jim is reported to have climbed Longs Peak 428 times. Jim died October 25, 2016 at the age of 60. He was found with his climbing gear on near rock formations close to his home and had injuries related to a fall. He had climbed the West Buttress of Denali as recently as June, 2016. Beautiful parting words were posted on the web by a close climbing partner Lisa Foster. Words from Michael Mills Kiley, grandson of Enos Mills, follows below. For 4 days I’ve been mired in sadness and unable to carry on with the normalcy of life after learning of the untimely and shocking death of my good friend, Jim Detterline. Jim’s beautiful wife Rebecca called me Tuesday evening after Jim’s body was discovered at the base of a series of rock cliffs near Allenspark. Jim sustained significant internal trauma determined to be caused by a fall in a roped-solo climbing accident from a 15-20 foot high cliff that is about a half mile from their home. He was 60 years old. 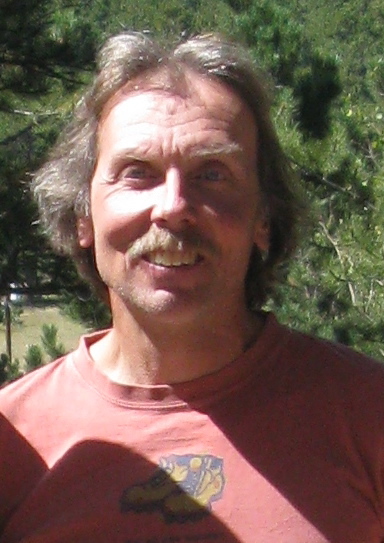 Jim worked for Rocky Mountain National Park from 1984 to 2009. He worked for many years as a Longs Peak Supervisory Climbing Ranger and Law Enforcement Officer. He climbed Longs Peak more times than anyone in history—a total of 428 times. I was lucky enough to share 8 of these successful Longs Peak summit trips with Jim, as well as innumerable failures where we went out to attempt to climb the peak but got thwarted for various reasons, mostly due to high winds and unstable snow conditions. These “failures” were some of my favorite times with Jim, as we laughed and shared stories and reveled being in the elements. Outside of our time shared on Longs Peak, Jim and I spent many, many hours rock climbing, ice climbing and mountaineering in RMNP and elsewhere in Colorado. Jim was larger than life. He lived passionately and vibrantly, and had a dry, witty sense of humor and infectious laugh that became his trademark. He was a dear friend and an impressive climbing mentor. He was the toughest guy I knew. Jim was a talented trumpet player who played with the Estes Park Village Band for many years. He graciously volunteered to play music for weddings, funerals and all kinds of community events. Jim was well educated, with a Master’s degree in vertebrate zoology, and a Ph.D. in invertebrate zoology. As a herpetologist, he kept many reptiles as pets, including several species of turtles, a caiman, snakes, a chameleon, and other creatures. He saved an African spur tortoise from the Colorado flood in 2013. Jim was hearing impaired, but it didn’t slow him down. He was an effective advocate for those with hearing loss and routinely helped children with hearing problems. Jim took me under his wing in the late 1980’s and taught me how to ice climb, and instilled a great respect and sense of admiration for Longs Peak in my soul. He encouraged me to pursue the female ascent record on Longs Peak, which became a reality in August of 2015. Jim fueled my passion for the outdoors and always supported my alpine dreams and goals. Jim had many stories to tell. Thankfully, he recorded many of them in his unpublished book, “From Zero to Hero and Back Again.” I have read this book and it is enviably well written, excessively engaging and ultimately entertaining. In the introduction, he states “There is a fine line between being a “Zero” and a “Hero.” I don’t believe that anyone actually desires to be a Zero. And most persons who outwardly desire to be Heroes are incapable of becoming such, as the very nature of being a hero generally precludes those who lust for the status. Although I have been cited both as a Zero and as a Hero, I didn’t ask for, nor aspire to either title. I simply tried to do my best when faced with certain critical situations.” Jim was presented the Department of the Interior’s Medal of Valor for the 1995 rescue in which he saved two people from drowning in a rushing river near Horseshoe Falls in Rocky Mountain National Park. The Valor Award is presented to Department of the Interior employees who have demonstrated unusual courage involving a high degree of personal risk in the face of danger. This was the rescue for which Jim was most publicly lauded, but he mused that his “most difficult rescues were not those we had been commended for.” He went on to say “The Horseshoe Falls rescue, for example, took place in only ten minutes, compared to the continually dangerous and frigid all-night rescue of Matt McClellan from the Narrows of Longs Peak in 1991.” He performed over 1,200 rescues in his career, saving many lives. He always made it a point to spend extra time with the victim’s families and treated every person he met with honor and respect. Jim married Rebecca Stegura Detterline on November 17, 2012, and I am so grateful that she came into his life. She brought him immeasurable joy, and I am so happy that the last few years of his life were spent with someone so loving, kind, and generous. Oh, and she's hilarious too!!! Jim touched tens of thousands of people with his passion for Longs Peak, his dedication to the sport of climbing, his interest in statistics and history, and his devotion to his friends and family. Jim was the kindest and best of men. He was a talented climber on rock, ice and snow. I am so fortunate to have known him so well and to have been able to share so many amazing and beautiful adventures with him. I will be forever grateful that I knew Jim, and he will continue to inspire me, and thousands of other people, to be the best we can be at all we do in life. Jim always put his best foot forward and encouraged others to do the same. He was an inspiration and a LEGEND. I will always miss him. I was saddened to just learn that Jim Detterline died in October 2016, apparently from injuries rope soloing. (I am Enos Mills’ grandson and also a climber who did most of my last 30 years of 50 years of rock climbing, rope soloing, and I know its joys and dangers.) Jim was a wonderful human being and was one of the shining lights of the National Park Service. When I first met Jim late in my life, and I told him it was an honor and that I had heard so much about him, he just returned the compliment. I wrote a little-read book in 2004 in which Jim figures prominently but anonymously, Canyon, available from Amazon (under the pen name Everett Smith). Jim left our world a better place, and he would have been embraced warmly as a fellow spirit by Enos Mills. President, Colorado Alpine Advanced Trauma Care Project, Inc. Following is information gathered in 2010 regarding Jim's climbs on Longs Peak. Jim Detterline's many climbs of Longs Peak, over 359 as of Sept. 26, 2010, places him at the head of the list of those with multiple recorded climbs of the mountain. His many climbs include being hit four times by lightning, three times on Longs Peak, once on the North Face of Grand Teton. On one of those occasions, while leading a climb on the Diamond (East Face of Longs Peak) he was blinded for about an hour. His climbing partner, Duane Kitzis guided Jim down to the belay ledge as there was no protection placed above the belay. Jim continued to lead the climb after his site returned. During his many climbs of Longs Peak, Jim was involved with a number of rescues and recoveries from fatal accidents. Jim tells the story of one unusual event. "On the story about the fellow whom I witnessed fall to his death, first of all he was a hiker and not a climber (climbers have an identity problem when hikers involved in accidents are classified as climbers, as it gives the sport of technical climbing negative public relations). Secondly, at the time he fell, I just happened to be nearby. My partner and I had earlier cautioned him to be careful, and also corrected his off-route mistakes several times. He fell 450 feet to his death. I did over 1200 rescues during my career, many but not all on Longs Peak." Here is a story about Jim after his 300th ascent of Longs Peak. And again, after his 351st ascent. The climb up Longs Peak via the most popular route is a serious scramble that requires careful attention at all times. Here is a recent fatality report and comments by Jim. You can find here an introduction, written by Jim, to Longs Peak: the story of Colorado's favorite fourteener by Dougald MacDonald. There are many references to Jim in this book. As well as being a climber and ranger, Jim has a PhD in Zoology and has authored several books on climbing.